"We truly enjoyed our wedding service. You captured our dreams, wishes and Scottish theme throughout the wedding ceremony. Thank you so much!!!" "Thank you so much for being a part of our wedding day. Also, thank you for being so easy to work with and for making this special for us. We really appreciate all that you do! Thank you again!!" "I wanted to thank you for the beautiful ceremony that you officiated at our wedding. We have received many compliments from family and friends who have said that it was one of the most touching ceremonies they had ever attended. Harvey and I feel very blessed to have found you!" "Rev. Dan, Thank you for performing our wedding ceremony. You did such a beautiful job and we received so many complemnts. We appreciate your flexibility and for working with our individual needs. We will be recommending you! Thanks again!" "Rev. Dan, Thank you so much for the wonderful job you did with our ceremony! Everything went perfectly and we appreciated the special touches you added to the ceremony. Best wishes,"
"Pauline and I want to thank you for uniting us in Holy Matrimony. The ceremony was beautiful and everything went just as it was meant to, just as you assured us it would! May God Bless You Always!" "Many thanks for a truly wonderful ceremony. We thoroughly enjoyed working with you during this process. You have a knack for keeping everything easy and simple - something extremely important for nervous brides and grooms! We sincerely appreciate you helping us make our "big" day a truly special one. Thank you again!" "Dearest Rev Dan, We just wanted to take a moment and thank you for such a wonderful service on Saturday! We will be heading home and back to our responsibilities on Monday, but we wanted you to know how much we appreciated our ceremony and also your time and assistance in helping us find such a nice location for our special day. Take care and God Bless!" "We just wanted to send you a note to thank you for the wonderful services that you provided for our wedding. We received many compliments on our wedding ceremony, and many of those were due to the role that you played! If we are ever asked, we will enthusiastically recommend your services to others." "Thank you for making our daughter's wedding truly special last weekend. The ceremony was spiritual, lively, and very appropriate to send Lisa and Joe off on their journey together. We have watched the video of the ceremony at least twice and can't believe how everything came together so beautifully after our last minute rain shower threat. Lisa and Joe selected the right person to officiate at their wedding, and we are eternally grateful that you were available on their date." "Thank you for our wonderful wedding ceremony! Our family and friends are still talking about the beautiful ceremony you performed for us and how it reflected our personal beliefs. Thanks for going the extra mile to work with us in making our wedding day so special." "Jackie and I are grateful to you for working with us on such short notice to plan our wedding ceremony. With only a few weeks notice you helped us pull it all together to make our wedding such a memorable occasion for us and our guests. Thanks for making our wedding so wonderful!" "We just want to thank you for performing such a beautiful wedding ceremony for us last Saturday. Your words were so appropriate and so much appreciated! Take care and God bless!" "Your inspiring words for us at our interfaith wedding ceremony will always be remembered by John and myself. Thanks for all you did to make our wedding so beautiful and memorable. All of our guests told us that we were so lucky to have found you!" "Fernando and I were deeply moved by the beautiful bilingual wedding ceremony you performed for us. Everyone greatly appreciated your inspiringand thoughtful words to us and the inclusion of Fernando´s vows in Spanish. Thanks for including the Hispanic traditions of the lasso and coins. That was so special to us. You made our day!" "Rev. Dan, Thank you so much for performing our marriage ceremony! Everything turned out even better than we had wished for, and the ceremony was beautiful! We are so glad we found you, and so happy to be married! Thank you again, and Happy New Year!" "Married life is great! Thank you for performing our wedding ceremony. 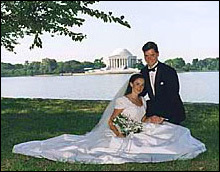 You helped in making our wedding day so very special." "We wanted to thank you with this note for a very meaningful ceremony. Also, your Spanish skills added so much depth of meaning for us and our families. Regards and best wishes,"
"We truly appreciate everything you did to make our wedding day a spectacular one. We were impressed with your professionalism and sensitivity to our needs at this important time. Also, our parents were especially moved when you called them up to the altar to be around us for the final nuptial blessing."